An aerial shot of an iceberg over the Strait of Belle Isle in Southern Labrador is a unique way to see these natural wonders as the tip of the iceberg is much smaller than the base. An aerial view of an iceberg lets you see how massive the base of an iceberg can be while what is left of the tip slowly breaks away into the surrounding water. Small pieces from the iceberg float away and once the entire tip melts, boaters around Southern Labrador must always be leery of any massive pieces of ice that linger under the surface. 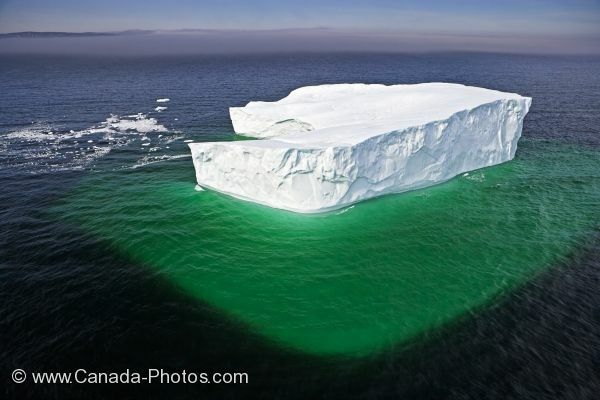 Aerial view of an iceberg in the Strait of Belle Isle, Southern Labrador, Labrador, Newfoundland Labrador, Canada. Aerial of an iceberg in Southern Labrador as the tip slowly melts and breaks away while the base still has a long way to go.